Chestermere has earned the title of Alberta’s Oasis. This dynamic, recreational city, situated outside of the Calgary next to the pristine Chestermere Lake, offers its residents a laid-back, but active lifestyle. Chestermere’s idyllic nature has led to a recent population surge, making it one of the fastest-growing communities in the country. Only a decade ago, the community was home to 11,000 residents. Today, over 20,000 call the City home. According to Katie Lamanna, City of Chestermere Communications Officer, as the lakeside community continues to grow, it is important to its local government that it continues to meet the needs of its growing population. To help ensure the City is communicating with residents and visitors in a timely and efficient manner, it relies on the CivicEngage® content management system (CMS) from CivicPlus®. The City of Chestermere made the transition from its previous, outdated CMS to CivicPlus five years ago. To ensure a better end user experience, and streamlined administrative management, the City decided to consolidate its domains and redesign its website on the CivicEngage CMS. Four years after its initial CivicPlus website launched, the City of Chestermere worked again with its CivicPlus team to redesign its website and transition to the enhanced CivicEngage Aurora CMS platform. 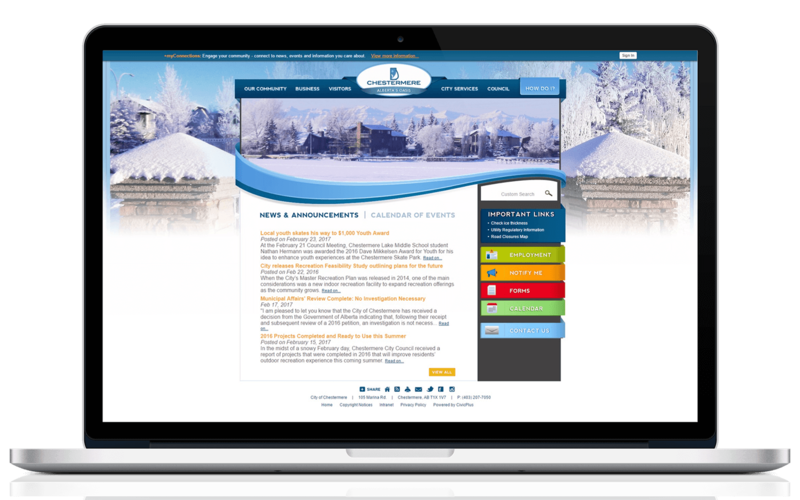 Not only did the redesign offer the City an opportunity to refresh the look of its website, and reconfigure its content and navigation to better meet the evolving needs of its citizens, it was able to optimize its website for mobile users. At the time of the redesign, the City of Chestermere also took advantage of CivicPlus’ subsite offering and developed a unique subsite for its Economic Development Office. According to Lamanna, the redesign process was successful, thanks to the collaborative efforts of the City’s internal committee, and its CivicPlus project management team. “We were intentional about collaborating with staff from each department that were going to be impacted by the website redesign,” said Lamanna. Much of the City’s redesign process focused on the website’s usability, and on placing the types of content on the homepage that is most frequently sought by visitors. The team’s decisions relative to content and navigation were informed by data received from its previous CivicPlus website, and analyzed with the help of its website design and project management team. Lamanna further explains that the move to CivicEngage’s Aurora platform has provided greater functionality, and customization capabilities. “It’s been important to us that the new platform provides more functionality to customize the homepage. It also allows us to link to our social channels, which has been important in our efforts to engage our citizens." As a result of its redesign efforts, the City of Chestermere is able to maintain a digital presence that better reflects everything that is unique and beautiful about Alberta’s Oasis. “Our redesigned website has a more modern look, and it’s mobile friendly,” said Lamanna. Lamanna believes the efforts to redesign the City’s website have been effective in allowing its citizen end users to better find the local news and information they are seeking as well. The City of Chestermere is continually working to optimize the effectiveness of its CivicPlus website by regularly reviewing its website analytics. Immediately after the website redesign launched, the City also embedded a survey on the homepage, which was built using the CMS’s Form Center, which asked users to provide feedback on the new design. According to Lamanna, the responses were positive, which reaffirmed for The City that its efforts to better optimize its website were effective. The City also promoted its website redesign with a news release sent to its local media, and a social media campaign that highlighted the website’s newest features. Not only was Chestermere successful in redesigning a website that better met its citizens’ needs, it earned recognition for its efforts with a gold medal in the 2017 dotCOMM Awards. 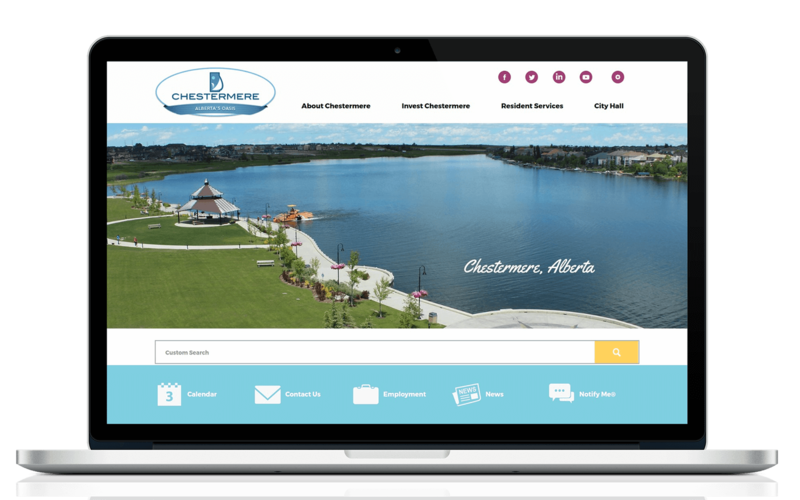 The award competition, which recognizes excellence in web creativity and digital communications, recognized Chestermere’s civic website for its redesigned, fresh, and modern look. “Overall, it was a very successful redesign process with CivicPlus,” added Lamanna. If you would like more information on how a redesigned civic website can better help you meet your civic engagement needs, download our Local Government Website Redesign eBook.